There is a devastating humanitarian and economic crisis happening in Venezuela that we simply cannot stand by and ignore. When the scale of this issue was brought to Siobhain’s attention, she immediately met with a number of local residents who were extremely concerned about the welfare of their friends and family. These are the same worries shared by the 5,000 British Venezuelan citizens in the UK. The family food basket currently costs almost five times the monthly salary of the majority and this has left 82% of the population in poverty. Diphtheria has come back after eradication, malaria has multiplied 10 fold since 1999, and maternal mortality has increased 67% in the last year alone. It is estimated that 54% of children are suffering from malnutrition whilst infant mortality has risen by 30% since 2012. Meanwhile, there are a staggering 78 homicides on average every single day. Following her meeting with the local residents, Siobhain raised the issue and spoke about the crisis. She invited those residents to join her at the debate. 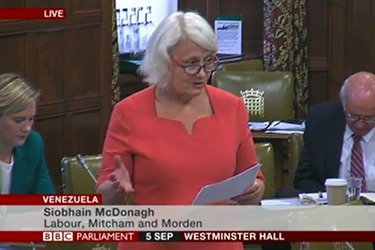 In her speech, Siobhain shared the awful stories told to her by Marifel, Jennifer, Erika, Leana, Militza, Thamara and Maria about the conditions their loved ones are suffering in Venezuela. She highlighted how the huge economic problems are resulting in increasingly worrying levels of health, food and crime problems.